John McCain, the U.S. Senator from Arizona, admitted to playing a game during a Congressional hearing over Syria, on his iPhone. A picture was published in a Washington newspaper that showed the Republican senator, playing a game on the phone. McCain is a strong advocate of using military action in Syria due to the alleged use by the Syrian government of chemical weapons in August. McCain alluded sarcastically to a scandal on his Twitter page, pointing out that the hearing was over three hours in duration and adding that the worst part was he lost. However, the senator was criticized by some. John Kerry the Secretary of State and other senior White House officials urged the Foreign Relations Committee during a hearing on Tuesday that military action was needed in Syria. The U.S. believes the current regime is responsible for the deadly attack that used chemical weapons on August 21 in a Damascus suburb. McCain latter said in an interview with a major network that he likes to always listen to his colleagues remarks, but over a three hour period he occasionally became bored and restorted to playing poker. 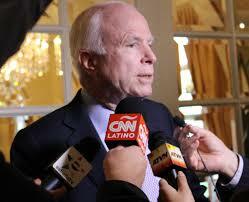 McCain, a former Vietnam War prisoner of war, was first elected to the House and then the Senate from Arizona. He has over the years built a reputation as being a maverick for not always sticking to the party line on certain issues, such as with immigration and campaign finance reform. In 2008, McCain won the Republican Party nomination for the White House, but was soundly defeated by Barack Obama. McCain was also one of the Senators referred to as the Gang of Eight that helped draft the immigration reform legislation that was passed in the Senate but has been forgotten in the Republican controlled House.